It seems that villain Gorothúl hid some powerful evil relics in Moria. Reports from scouts indicated the likely places to be the Mirror-Halls of Lumul-Nar, and the Water-Works of Nalâ-dûm. Thus did Autumn Tian continue assisting the dwarves. It had been some time since I had done these two quests, but immediately upon entering each one it came back to me: these were the “puzzle” quests in the storyline! Mirror-Halls required repositioning a few mirrors so a beam of light would open passages deeper, and Water-Works required pulling some levers and turning wheels to open passages and gates. I set aside plenty of time, but both went pretty fast. I’m pretty sure the mob density was thinned, even on top of the “solo” option, because I only fought about 15 enemies in the entirety of Lumul-Nar. Except for how long it took me to solve the last part… I’ll leave that for later. Lumul-Nar starts with a giant drop into a snowy cave. At the bottom were two wolves, easily dispatched, and the first hint of what to do: a blocked passage and a lever. There is literally nothing else you can do but pull the lever, which rotates a mirror, in turn bouncing a light beam down a tunnel that now opens up. I proceeded in a similar fashion further into Lumul-Nar. I made it to the final room, where the puzzle shifts slightly: from a roughly square platform, align mirrors so light beams from the corners meet over a central lens. The only sneaky thing is one light beam requires getting bounced over and back, due to how the mirrors are placed (not just a simple route from each corner to the middle of a side and then into the center). Naturally, I configured it wrong, figured that out when the last beam couldn’t be directed properly, and then had to shift 6 mirrors for the other 3 beams of light plus several for the 4th beam. While this happened, I started losing beams of light. I went to investigate, and found respawned Merrevail blocking the light beams! Well that’s what I get for being slow, so I had to battle a handful more enemies before finally opening the last web to the final fight with Ergoth, who lamented failing The Eye as he fell to my swords. 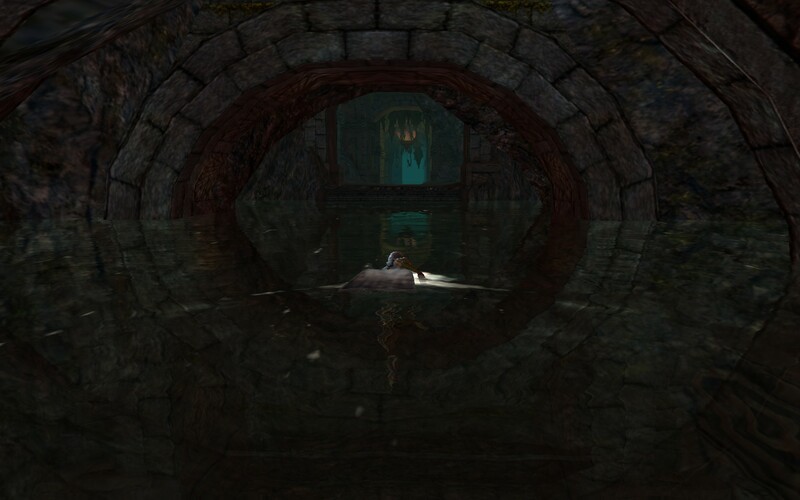 Soon I was in the Water-Works of Nalâ-dûm, recalling lizard, grates, and levers. From the entry spot, the only path to follow led up to a wheel. I spun it, which opened a gate below, allowing progress. I had to try a few times at one spot where there was a wheel and a lever. I spun the wheel, pulled the level and ran down, only to find a grate partially extended over a chasm. After trying again, I remembered passing a gate earlier. I turned to look at the gate when I pulled the lever, and it opened. So I ran up and in, fought a Caerog and then jumped down a hole into some water. Swimming back I found myself on the other side of the partial grate chasm, with a lever as well. I think this is how a larger group gets across – I remember something about needed one person to spin the wheel while another pulls the lever and runs for the gate before it closes. In any case, I battled deeper until I found another evil relic, and destroyed it. The final fight against Caerlûg, a big Caerog. It was a bit tense, mostly because of some giant piston-like ceiling crushers that would stomp the ground. Caerlûg would unleash an attack that knocked me backwards into the air, and I was concerned I’d land under the crushers. I’m not sure if those would have hurt, but I also didn’t want to find out so I would move immediately to a safe spot, and then re-engaged Caerlûg in battle. He fell as well, and I left off with speaking to Stóthkell in the Heart of Fire. One of my gaming resolutions for 2014 is the divide my time between games a little better. I tend to play in streaks: weeks/months of a game, then a long break while I play a different one. Not exactly “juggling” very well! If I were playing 2 games, the split is most definitely not 50-50, it is more like 80-20. The split for 3 games is more like 70-20-10 where 50-25-25 might be more reasonable… 33-33-34 is very even but also unlikely. With that in mind, I decided to log back into GW2 and piddle around a bit. I have one level 80 char, an elementalist, but that didn’t quite click. I could get by, but to be a notch better requires attunement swapping, which in turn means remembering 20 skills instead of 5, and also remembering which ones are combo fields and which ones are combo finishers. The other thing the elementalist has against it was history: my favorite professions from GW were ranger and mesmer. The whole reason I went elementalist in GW2 was to try something different. Anyway, so I logged into each char and surveryed their inventory. I had two that reached one year old and I received the first birthday presents on each, which included an experience scroll. Haha! 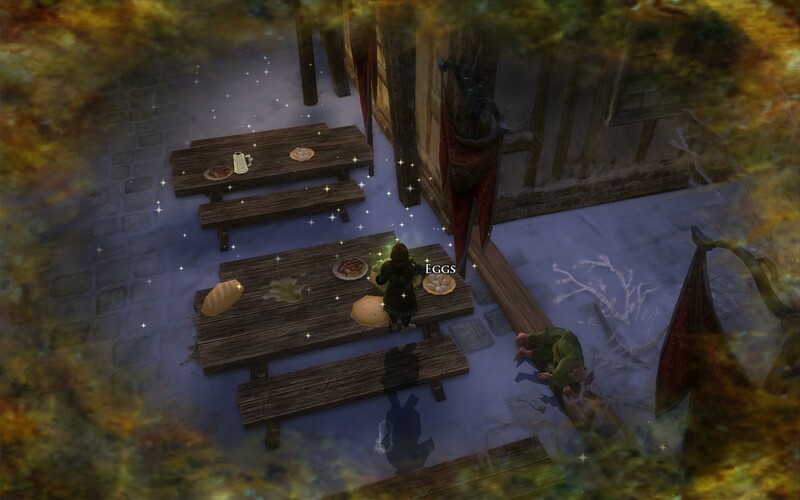 So shortly after getting a level bump in LoTRO, I get two of them in GW2! My mesmer was already level 39.5, so ineligible. I thought for a while and decided to use the scrolls on 2 other chars: a ranger and a guardian. I made an Asuran Warrior, and played with the goal of unlocking all the weapon skills. 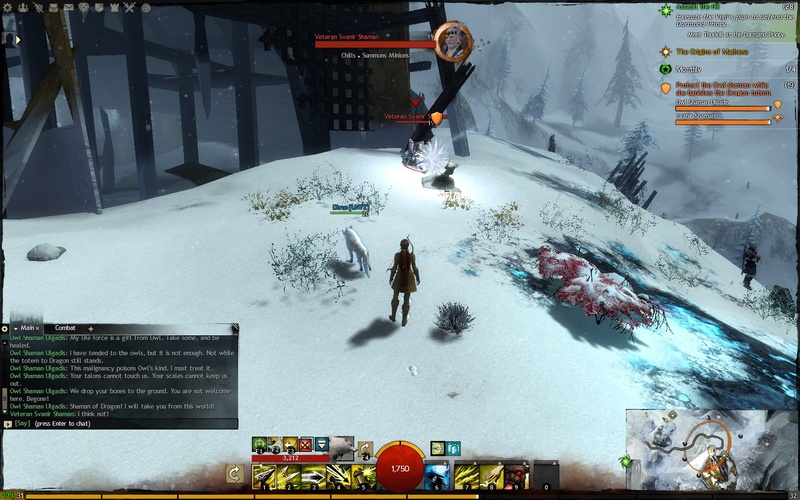 For people unfamiliar with GW2, the first 5 skills your character has are locked to weapon and/or offhand. Starting out you get the first weapon skill, and through killing mobs the others slowly unlock. The 2nd and 3rd skills unlock fairly quickly, but the 4th and 5th take longer. Since the warrior has access to many weapons and offhands, I was nearly 10th level before all the skills were unlocked. In fact, it was right about the time in every character’s leveling process that you finish up what is reasonable in the starter zone, but aren’t quite able to handle the rest of the zone. What I’ve done on every char is head back through the local Asura gate and warp to some other starter zone, to gain a few levels and then return. Since I’ve done the content in Metrica Province (the Asura starter zone) and Caledon Forest (the Sylvari starter zone) several times, I opted for The Plains of Ashford (Charr lands) for a little variety. Ultimately, I decided I didn’t like the Warrior. Well, that isn’t it exactly, it is more the playstyle. Same thing with the Elementalist… yet I like the Mesmer and Ranger more. But not as much as I did in GW1. Hm… this puzzled me and I spent some time trying to figure out what it was before I finally hit on it. The difference is, basically, getting directly hit in combat. That sounds weird since the fundamental content in every MMO is: kill the enemy while it attacks back. But there was something a little different for these games – what was it? The answer is: more tactical gameplay. GW offered AI NPC’s, henchmen and eventually with Nightfall, heroes. The content was balanced for a group, and if you didn’t have enough players in your group, you could always add henchmen and heroes. That’s how I normally played, outside of grouping with friends or guildmates. There were various advantages, but the one I liked most was the tactical gameplay: I could call a target (i.e. send in the H&H to attack), hang in the back and do whatever I thought was best: interrupt/shutdown a particular foe, apply conditions, and basically plink away and direct combat from a distance and remain relatively safe. GW2 doesn’t have henchmen and heroes. *sadface*. However, the next best thing is something else to attract/distrct a mob, which the ranger and mesmer do have: rangers have pets, and mesmers have clones. I think this is why I subconsciously gravitated towards the ranger and mesmer in GW2, and not so much to the elementalist, warrior, guardian, etc. When I play the ranger, I can detach myself from the mob while my pet attracts attention, and when I play the mesmer, I can create clones/phantasms that often (not always) let me do the same. Then when I’m not having something in my face I can choose how to continue the fight. This isn’t a make-or-break issue with the game as a whole – essentially I’ve found that the ranger and mesmer fill (or come the closest of the available professions to filling) that preferred playstyle I have. Since I worked this out, I might as well spend what time I play GW2 on leveling up my ranger and mesmer! I’ll still play my elementalist since that is my highest level char and can better join in on more content. Plus I want to get the attunement swapping down better, to be more effective at defense and offense. As I mentioned, I boosted Glyneth, my Norn Ranger, to level 20. The weapon skills unlocked quickly and by following the storyline I advanced quickly. Plus, I used another present, the birthday booster, to get a nice xp/gold bonus for everything. 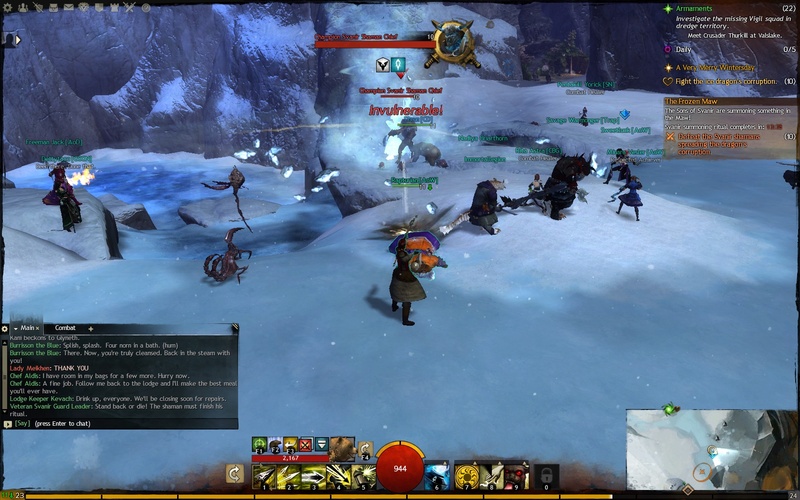 One fun thing about GW2 are dynamic events. They aren’t literally new and random and never before unseen, most are on some kind of timer. But if I’m near one when the announcement appears, I’ll make my way over and join in and do what I can. Many are staged: the first part is easy, then it gets tougher, and eventually you might need a huge number of players to zerg down the final boss. Fortunately, many other players helped with the earlier steps and stayed for the final battle. The screen looks busy because the fight was insane. It is basically a giant zerg fest where everybody just pounds every skill on recharge and maybe keeps and eye out for reviving downed players. Crazy but fun, in small doses. A few levels later, I was exploring in the corner of Snowden Drifts near the Owl Lodge. I noticed a dynamic event waiting to trigger: an NPC priest needed protection while clearing up the area. I started it and this one was smaller – soloable as the final fight was against a Veteran. Still fun! Later, I followed the storyline to Fields of Ruin, a zone I had never been in before. Cool! While questing around, I got the announcement that Scarlet’s forces were attacking Fields of Ruin. I did a double take – that’s where I was! And wait a minute – isn’t Scarlet Briar the new bad boss that swooped in after the initial undead dragon endgame stuff? I’m not sure since I’m oh let’s see, a year behind the latest content? For me to have the current content arrive on top of me was funny; I’m so far behind the Living Story I don’t even pay attention to “current” events and only have a minimal awareness of the latest happenings. But this was different, the current content was coming to me. 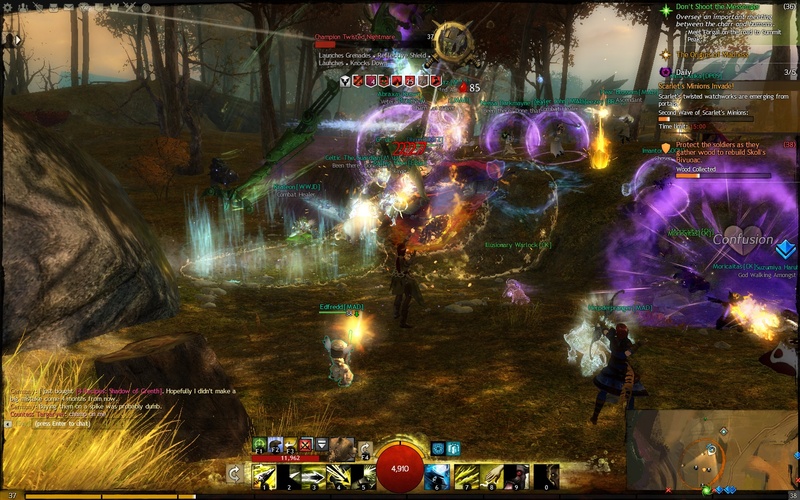 This is really awesome that the design of GW2 allows for this to happen. 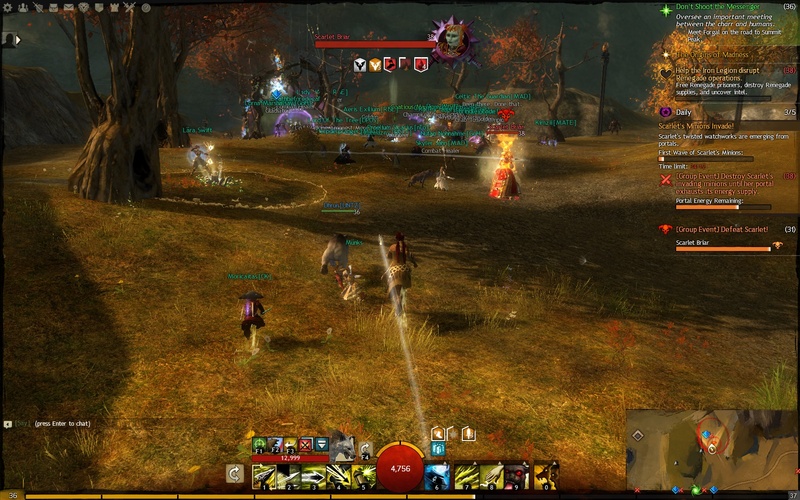 Since a character will be downleveled to the current zone, the “end game” boss can pop around to earlier zones. Higher level characters can still be appropriately challenged (up to the what the game designers want) and a player such as myself, questing along at the ambient zone level, can join on in. Good times. 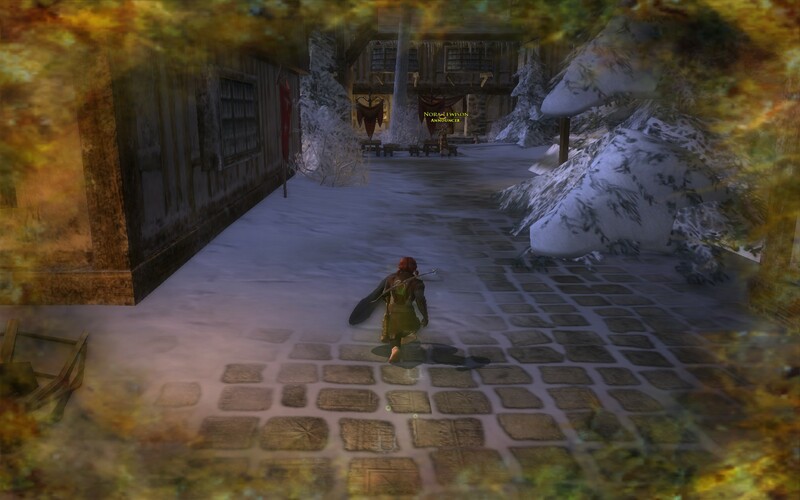 Eventually I got tired of zerging around and took a break. I’ll be sure to play GW2 on a regular basis, aim for once a week as I better try to round-robin the various MMOs I want to play. I decided to take a break from vanquishing the minions of Sauron, and instead enjoy the festivities at Winter-home. I didn’t partake at all last year, so I was eager to check it out. Later, Naerys spotted an eating contest. This appealed to her appetite and enjoyment of pursuing food-related titles… and thus began an epic 5 table stuff-yourself-until-debuffs-appear food tour. The first 2 tables were no problem. After the third, Naerys began feeling the effects a little bit. And with that solid advice, Naerys made it. Ha! As it happens, earning “Feast Beast” requires 8 successful food tours. Unfortunately, Naerys was only able to complete 2, leaving the rest to be finished off at next year’s festival. I will be more on the ball, as far as showing up daily to make the attempt, in order to get this title! It turns out that by questing around Lothlórien, I’ve picked up 2.7.1 “The Hill of Cerin Amroth” and 2.9 “Foreword: The Dark Shore”. So I’m not blocked from finishing Vol 2, I’m just blocked from some parts of it. And that’s fine with me – while I do want to follow the epic storyline, I’m also OK with doing it a little out of order while some issues are addressed. 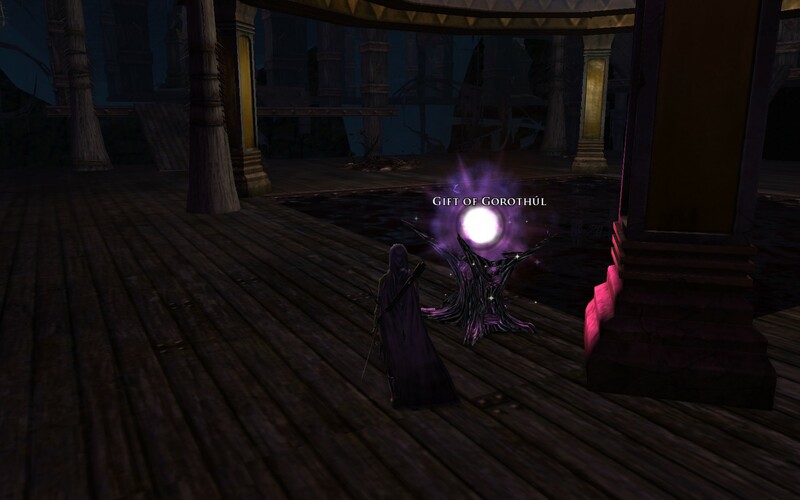 However, all that takes a back seat to grinding up Galadhrim reputation to Friend, which is needed to enter Caras Galadhon. 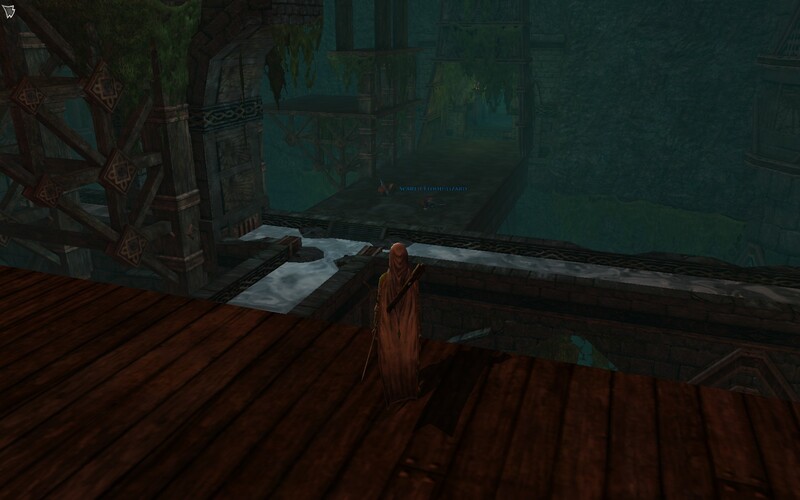 Note: in the case of the epic quests taking you into the city, it is possible to climb a rope at the gate to get in, so entry to Caras Galadhon doesn’t block progress. That’s a very nice consideration! So in my meandering around the Golden Wood, I’m working on any and all quests that give reputation. Bonus for ones that involve killing orcs since I’m also trying to finish off a racial deed, Enmity of the Orcs III, upon finishing will grant me Eldar’s Grace. I would also like to finish off Enmity of the Drakes to gain the Elf One-Handed Sword-Damage Bonus, so perhaps when I zip back into Moria I’ll work on that. Or, I think outside Stangard are lots of drakes. Hm…. One reputation quest I’ve decided to skip is out of Echad Andestel, Aiding the Elves IV, a.k.a. 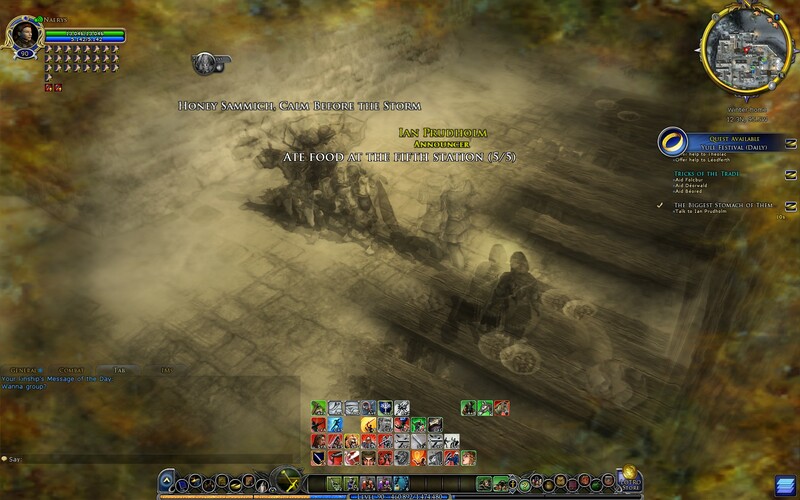 the Orc Poop Quest, whereby I’m supposed to collect and burn orc-filth in a fire. I’ve decided that as a Champion from Lindon, am too good for this quest so these other layabouts at the camp can do it. 😉 Fortunately, Aiding the Elves I and II from quest givers on Talan Haldir will substitute nicely. Especially since those quests involve killing Orcs and that brings me closer to Eldar’s Grace. My plan to progress through Moria by following the epic storyline has hit an “epic” (har har) snag… more on that in a bit. First, I see little tweaks all over the place. 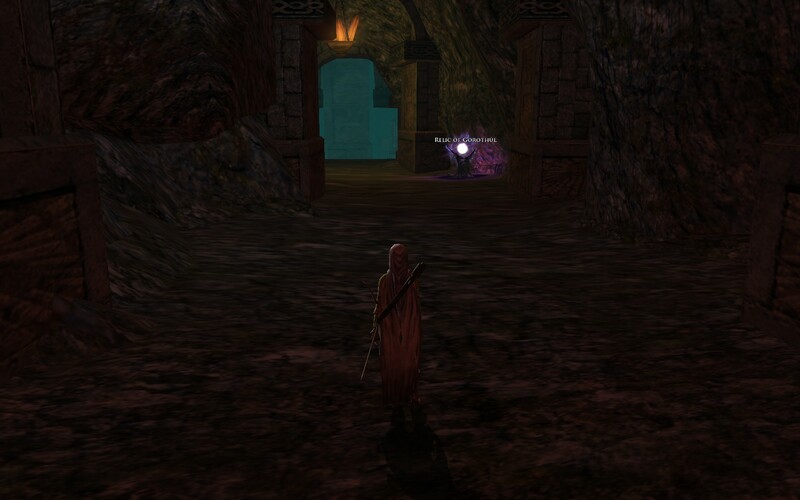 Quests moved, new small quest hubs – in Durin’s Way there is a horse (er… goat) point at Tharâkh Bazân and the Fanged Pit, quests that originally were started in the Chamber of the Crossroads have moved to a new quest cluster at ZirakZigil, etc. While looking for Sweina, a dwarf under attack in the Silvertine Lodes, I saw a small quest hub/camp along the way. Fantastic! I remembered doing some quests in an area between 21st Hall and Orc-Watch, but couldn’t find any of the quest givers. So as I made my way to Orc-Watch, I detoured by to take a peek – and was presented with a location quest and several more to follow. This was another revamp that rewarded exploration. This area, Baiúrz-Mur, had a quest makeover as the new focus was collecting poison samples and destroying poison brewing stoves. So that’s the good news… the bad news is: the class revamping for Helm’s Deep has apparently screwed up some of the session play skills. In particular, for 2.3.9, We Cannot Get Out, you don’t have usable healing skills. This quest is a session play instance where you end up fighting in the Chamber of Mazarbul. In order to pass you have to survive until some invisible timer counts down… unfortunately with no healing skills it is extremely difficult (“impossible”?) to last long enough versus Mazog to pass the instance. Here I have 5 Fervour, but skill 6 and 7 aren’t enabled. I think they are trigger on defeat skills, so you could quibble that maybe I didn’t defeat an enemy recently enough, but trust me, they never enable at all. And this is before Mazarbul, but I took the screenshot here so I could concentrate 100% on trying to survive Mazarbul. It’s the same there as well, argh. After 3 or 4 attempts, I finally decided not to waste time while this is bugged. Might as well move on and come back when it is fixed. 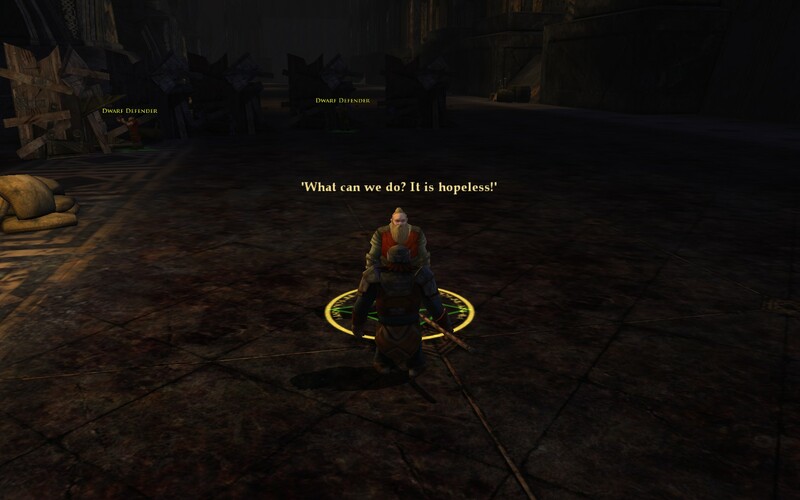 I found this quote by an NPC dwarf during the instance to be particularly ironic! As far as this bad news concerns the epic storyline in Moria – AutumnTian just reached level 58 from level 56, mostly following the epic storyline quests and adding in a few others that were in the same area (e.g. completing a few quests from Orc-Watch while looking for barrels of black powder). I also used Accelerated Experience perks and some Tomes of Extraordinary Experience to help multiply my xp gain (5 of those Tomes were included with the GoTV). 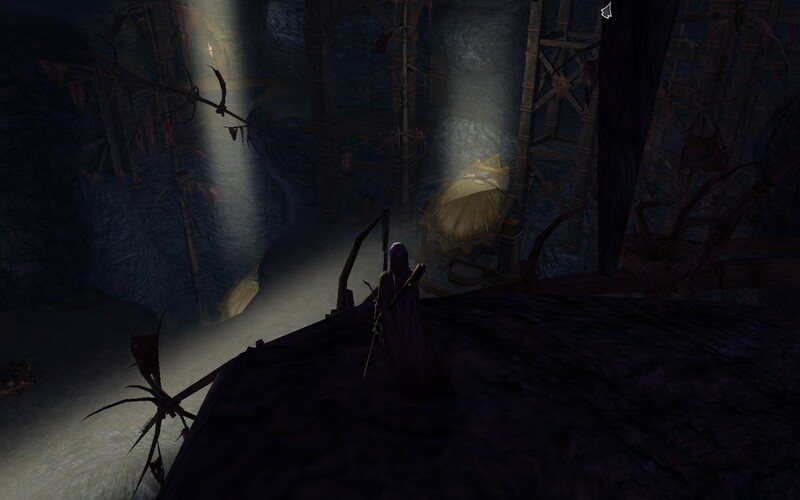 At level 58, cautious questing in Lothlórien is possible, therefore since I’m stuck in the Vol 2 epic storyline, my alternative is to… leave Moria. 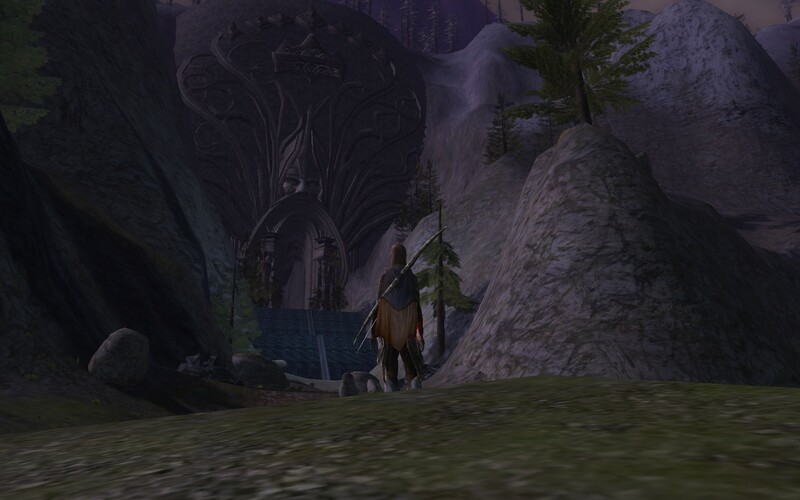 So, the new plan is to exit Moria immediately and work towards entering Caras Galadhon. 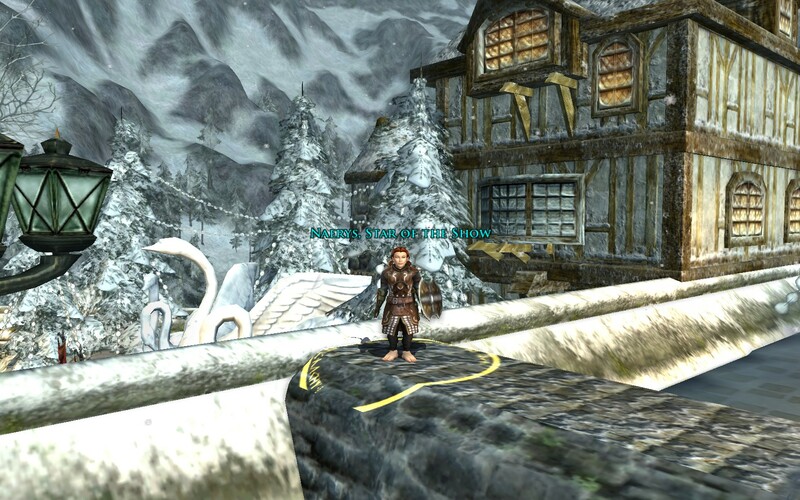 I’ll see if I can pick Vol 3 up from Pethelen in Rivendell, when AutumnTian reaches level 65. Since I know the way out of Moria through the 1st Hall, I just rode my goat through. The route is surprisingly mob free – sure you have to zig and zag, but I get unseated and knocked off in the hallway just outside 21st Hall. Yet I can ride from Sejer-tharâkh (the crafting/reputation instances) all the way through Nud-melek and out to Lothlórien and barely be touched!